This week. Gosh-a-mighty…this week has been something else. Tornadoes rolled in Monday and Tuesday (thankfully we were safe), we were supposed to close on our house TODAY but had to move it to next week, I’ve packed everything up due to the fact that we were supposed to close TODAY, and well…you get my point. So, to avoid inhaling a bag of Cheezits and eating an entire Chocolove Bar with Almonds and Sea Salt, I decided to sit down and write. I’m just going to live in denial for a second. Is that cool with y’all? Phew. Do you see that beautiful salad in the top photo? It was inspired by, yet again, Gina at www.skinnytaste.com. I swear, if you look at the sidebar you can tell that pre Weight Watchers, my love was Barefoot Contessa. Now that I’m Weight Watchers-ing it, my love is Skinnytaste. Both of them have the same result for me. Well, that’s not true. Both of them have one thing in common: no matter what recipe I’ve tried by both women, they’ve all turned out fantastic. Barefoot Contessa makes me feel like I’m on vacation and Skinnytaste reminds me that vacation can make your pants tight. All of that said, I’m really glad I found both women in my culinary adventures. In fact, I am going to dedicate this post to both of them because I got crazy with the cheez-wiz and used BOTH of their recipes for supper this week. Yes, even on Weight Watchers. 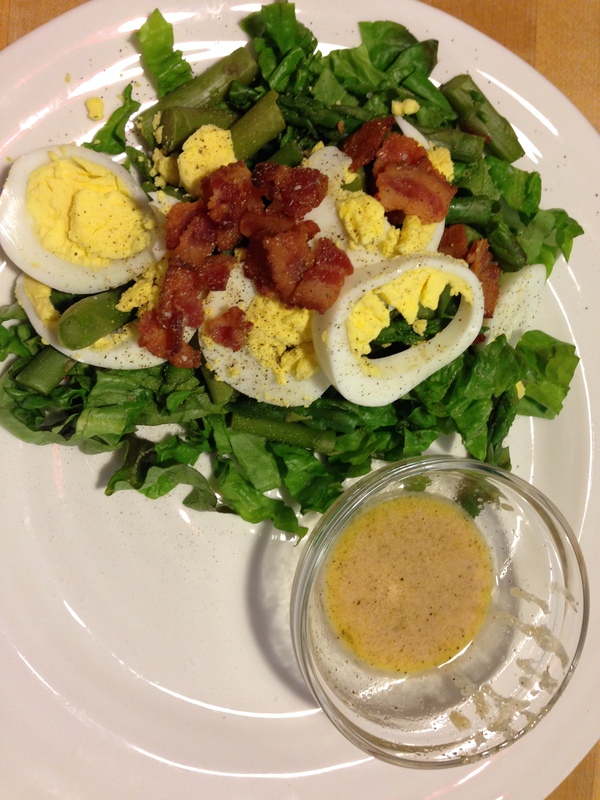 First up: Skinnytaste’s Asparagus Egg and Bacon Salad with Dijon Vinaigrette. I followed the recipe exactly.Verdict? 5 points. Taste? Delicious. Did I mention how beautiful it was? 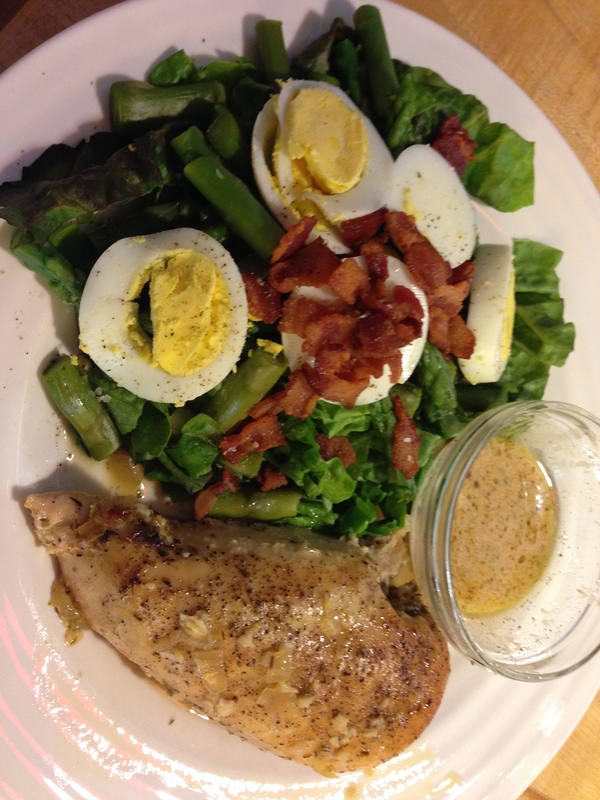 I paired the salad with Barefoot Contessa’s Lemon Chicken Breasts recipe. Pre WW I would have followed her directions without fail and kept the skin on because we all know it prevents the chicken from drying out and it just tastes better. Now that I’m in the thick of WW, I decided to use skinless (gasp!) chicken breasts. Sure, it was a little dry, but I felt like it was a sacrifice I had to make. 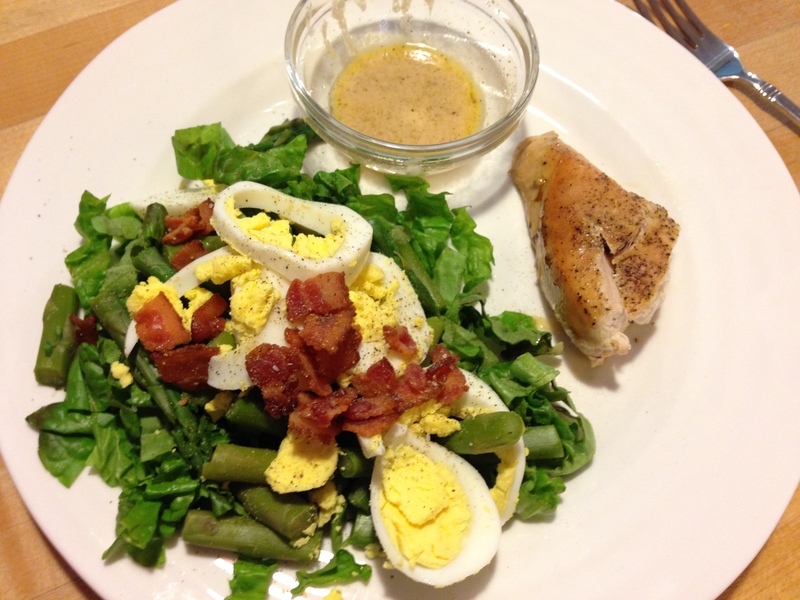 And want to see how I reconciled having a Barefoot Contessa recipe on WW? The top? My husband’s plate. The bottom? Um, mine. Talk about SACRIFICE — WW doesn’t play around with the whole “let the palm of your hand be your portion guide” business. Not sure what kind of points we are talking about, so I’m saying 3. Yeah, that sounds good. Oh oh oh! I apologize in advance for this to all of my Weight Watchers folks, but have you seen Homesick Texan’s most recent post? Lawd have mercy. Two words: Chicken Gorditas. If you are on Weight Watchers, do NOT click on THIS link. Did you click? You did, didn’t you? Perhaps we can put our heads together to see how far we have to walk or hike in order to cancel out the amount of points in that recipe. Because I kind of think it might be worth it. Okay, off I go. Back to reality: boxes, packing, transitioning, and all of that. Amanda, you are the best! I do wish I had your gifts of life view and joy. Sometimes a bit of hyperbole, but heck, I go to far on the side of understatement! I am enjoying following your journey, but I did wonder about not eating chicken skin aft WW I….did something happen around 1910 where we were supposed to not eat the chicken skin? I thought that was in the 1990’s! Cheers! Yeah but what did World War I have to do with it all? Ya know WWI??? ?